Ukraine's Government last March banned the country's athletes from competing at any events in Russia in protest of their neighbour's annexation of Crimea in 2014. They also claimed it was because of the doping scandal involving Russia's athletes. The Government in Kiev later scaled this back to recommending athletes do not compete in Russia and warning them, that if they decide to do so, then their trip will not be funded. Russian media reports claimed Ukraine’s First Deputy Minister Igor Gotsul had confirmed the country would boycott the event in the Siberian city, due to start on March 2 and last until March 12. This followed the February 2 deadline for countries to submit applications for their athletes to participate in the event. This was later denied by Ihor Zhdanov, Ukraine’s Minister of Youth and Sports. "The Ministry of Youth and Sports of Ukraine does not provide comments and does not respond to the information requests of the Russian media from 2014," a statement said. "The decision on participation of the national team of Ukraine in the Winter Universiade-2019 in Krasnoyarsk is within the competence of the Ministry of Education and Science, and more precisely, within the competence of the Committee on Physical Education and Sport of the Ministry of Education and Science of Ukraine. "The position of the Ministry of Municipal Sports on the participation of Ukrainian athletes in competitions in Russia remains unchanged: the preparation and participation of teams in such competitions is not financed from the State Budget of Ukraine, as well as payment of the corresponding prizes, etc. "All the risks for the presence of athletes in the territory of the country-aggressor take on the federation of sports and the athletes themselves." Russian Presidential Spokesman Dmitry Peskov claimed Ukraine’s absence from the Universiade was political. "We can only express our regrets in this connection," he told Russia's official state news agency TASS. "We regret that politicians are making such decisions, while students and athletes are suffering as a result of these decisions. "I do not think that the majority of athletes are happy with this decision and they would have been glad to participate in the Universiade." Matytsin has reportedly confirmed the organisation would not seek to sanction Ukraine, with letters having not been sent to either the FISU or Krasnoyarsk 2019 claiming they were boycotting the event. 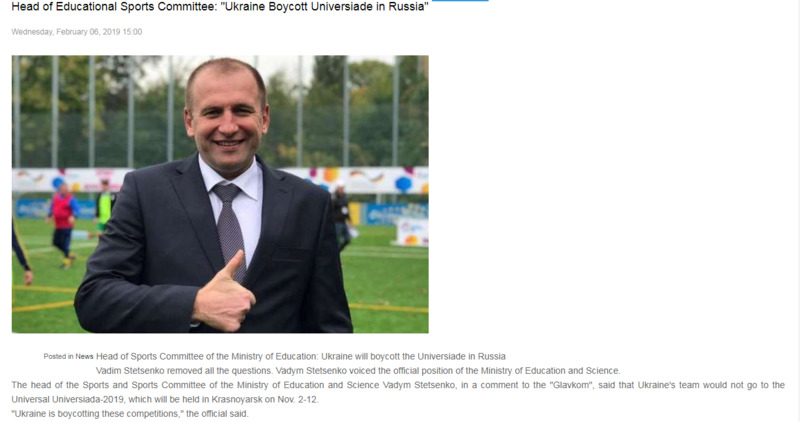 The website of Ukraine’s Committee on Physical Education and Sport of the Ministry of Education, however, appears to confirm a boycott of the Universiade. "Ukraine is boycotting these competitions,” Vadim Stetsenko, the Committee’s head, has been quoted as saying. Matytsin revealed the matter will be discussed after Krasnoyarsk 2019. "After the Universiade, the Executive Committee will discuss at its session opportunities of cooperation with organisations, which failed to take part in the tournament," he said, according to TASS. "It is highly important for us to receive official replies to our proposals on financial assistance from the government of Ukraine and from the National Olympic Committee since we have been already planning to stage some events on the territory of Ukraine in 2020-2022. "The political and economic situations are equally important for us as well as the Government’s guarantees on the observation of all FISU requirements regarding athletes’ participation in the tournaments, and we will be discussing these issues on a single agenda." 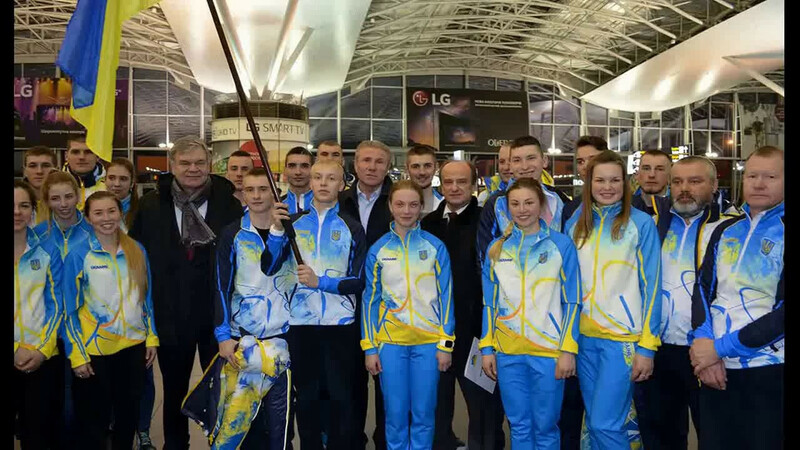 In October, Matytsin discussed with Ukraine's IOC members Valeriy Borzov and Sergey Bubka the question of whether their country would be able to participate at Krasnoyarsk 2019. 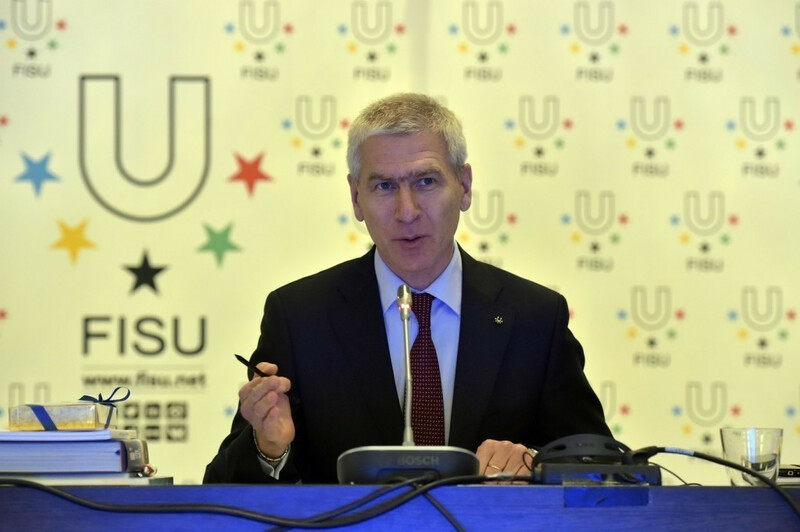 FISU later offered to fund Ukraine’s participation at the Universiade, while expressing their regret at the position taken by the Ukrainian Government. "It is simply not appropriate to make athletes suffer because of a political issue, especially when international sports events can do so much to promote peace and mutual understanding," Matytsin said at the time. FISU have expressed regret at Ukraine missing the deadline and believes it is a missed opportunity for the country's athletes. "Ukraine has a history of sending strong teams to the Winter Universiade," a FISU spokesperson told insidethegames. "FISU is disappointed to note the deadline for Krasnoyarsk 2019 has now passed without Ukrainian entries. "As with the 1725 athletes from 57 countries already entered, every assurance has been provided in terms of safety and security. "FISU and the organising committee also made an unprecedented offer of financial assistance after having been informed that Ukrainian government support for its national university sports federation's team was an issue. No response was received regarding this offer of financial assistance. 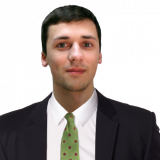 "FISU regrets the missed opportunity for Ukraine’s excellent student athletes, and FISU’s Executive Committee will consider the issue further at its meetings later this year." Both the organising committee and FISU are now focused on providing the best possible conditions for the 1725 athletes expected at the Winter Universiade. The quality of planning, preparations and operations in Krasnoyarsk give every reason to be confident the event will provide an excellent experience for those student athletes, positively shaping their bright futures. Ukraine finished 10th in the overall medals at the last Winter Universiade, in Almaty in 2017. They won a total of nine medals, including two gold.